Described in Brighton Evening Argus as a "macabre little comedy of manners”, the play was shortlisted for the Best New Play Award at Brighton Fringe 2013. Sophia Carr-Gomm, Charlie Partridge, Ipek Uzman & Nicola Stelfox. • "Really great. Brilliant cast. Great dialogue." • "The play was witty, beautifully structured and superbly brought to life." • "So clever to appeal to an audience 3 feet away. I was with them all the way!" • "Really great concept. Well-drawn characters. Truthful and believable. Funny and cruel Really enjoyed it." • "Excellent. Great script and wonderful acting." • "Very funny, witty, observant, entertaining. Great!" • "Great acting. Brilliant story." • "Great to see a piece of theatre in a normal place, not a theatre stage. Great acting and fantastic questions left unanswered at the end." • "Fabulous!. Had me totally taken in." • "Very enjoyable. When is the sequel? Want to see James in the cage now." • "Good dialogue - witty and intriguing." • "Interesting subject matter. Great acting and natural dialogue. Wouldn't have thought it would have been written by a man." • "Really enjoyable and interesting performance. Beautifully performed. Multi-layers and dimensions." • "Excellent. How do you become a member of The Revenge Fantasy Club?" • "Very entertaining. Like the way the story unravels gradually and keeps us wondering what is fantasy / reality. Very moving when Shelley weeps - sudden change of mood effective. Great setting, too. Well done." • "A well written dialogue and gripping storyline." • "Excellent. I was particularly impressed with the acting. The delivery was flawless. Would gladly watch again." • "Perfectly timed dialogue ... a thoroughly enjoyable play in a unique environment that served to enhance the production - the use of the 'world' was perfect." “... Shortlisted for New Writing South's Best Play Award, Mark Hewitt's two-and-a-bit-hander (there's a waitress) listens in on the two ladies at lunch and finds that their familiar chit-chat soon turns down some very dark alleys indeed. ... Hewitt's dialogue breezes along wittily and Jo Bowis gave expansive ease as the upmarket Bridget, whose occasional spiteful barbs are the stuff of female competition. Kathryn McGarr's rather more downtrodden Shelley showed all the latent chaos of a woman who knows she's making a big mistake. ... This was a macabre little comedy of manners ... ."
"... The interplay between the mismatched Bridget and Shelley is a seam of humour that runs through the piece, and the tensions created by the two women’s conspiracy are a source of genuine drama, too. Bridget in particular is a fine creation, well-executed by actor Jo Bowis: posh, poised and precise, she’s rather easily shocked by the less-than-classy Shelley. The back-story of the titular Revenge Fantasy Club is fed in nicely, with Shelley’s induction into the society proving a natural opportunity to deliver exposition with a deft and inconspicuous hand. For much of the play, there’s a pleasing ambiguity about what’s really happened to the detested James – although the word “fantasy” in the title was perhaps something of a spoiler, pre-empting what could have been an interesting plot twist for me. The ending, to my mind, left a little too much unresolved, though I’m sure the lack of closure is entirely intentional. The play concludes with a big question left hanging – and while you think that you know the answer, there’s that nagging little worry that the truth might be much worse than it seems. ... this is a solidly entertaining play, full of bitchy put-downs and recurring comic themes. It fits well, too, in the corner of a café: I’m a big supporter of theatre in unconventional spaces, and playwright Mark C Hewitt has intelligently built a piece which would make sense in coffee-shops and tea-rooms the length and breadth of the land. 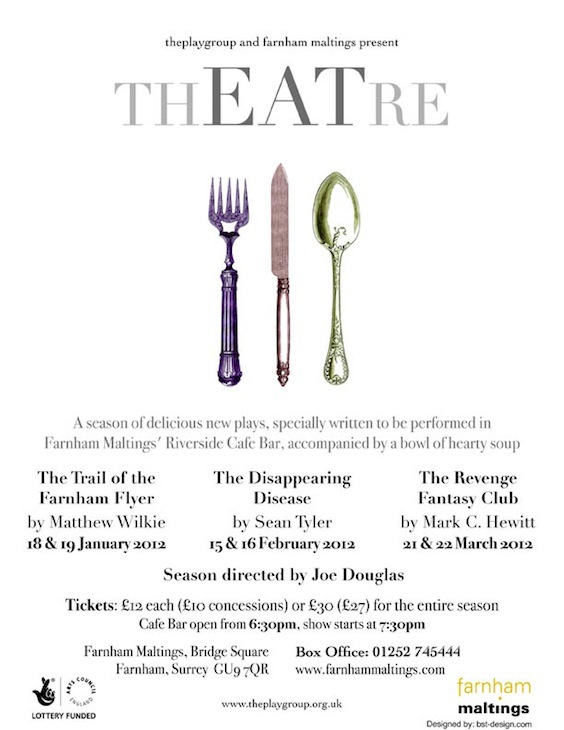 ... "
Previewed 21 & 22 March 2012 at Farnham Maltings in Surrey as part of Eat Theatre, a season of new plays presented in the café bar at Farnham Maltings. The project was originally developed through writer-led theatre initiative, theplaygroup, and was performed by Kathryn McGarr and Jo Bowis with The Waitress played by Claire Barber. These previews were directed by Joe Douglas. "Excellent. Really enjoyable, light hearted with dark moments. Lots of humour. Performances were excellent too." Nor hell a fury like a woman scorned ... "
"Feel the power that comes from focusing on what excites you."